Next time you walk past the Naumburg Bandshell on the concert ground, you might hear a musician playing classical or even popular music. But in 1862, a cast-iron bandstand stood where the Beethoven statue stands today, and the straight-laced Central Park commissioners did not approve of popular music They wanted the public to hear only refined, classical music. By the 1890s, marches by John Philip Sousa, choral and folk music were added to the repertoire. Then, in the 1920s, popular music was added to the mix. In 1923, the acoustically outdated Bandstand was replaced by the Naumburg Bandshell. 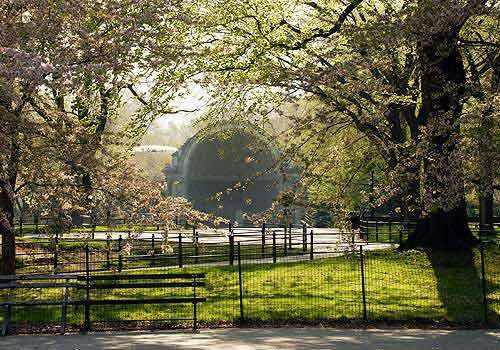 It encouraged new audiences for classical music in the informal and beautiful setting of Central Park. Today, it is the Park's only Neo-Classical building, thoughtfully centered and nestled between the two projecting pergola viewing points. It admirably reflects the architect William G. Tachau's own Ecole des Beaux-Arts classicist and historicist training. Such greats as Irving Berlin, Benny Goodman, and Duke Ellington have entertained at the Bandshell, as well as Victor Herbert, whose statue is just a few steps away from that of Beethoven. Those statues, as well as the other 49 statues throughout the Park, are given a cleaning every summer by the Central Park Conservancy. The Conservancy also built and maintains the beautiful and unique wooden benches surrounding the nearby trees, based on an original bench design introduced to Central Park in the mid-19th century to protect the young elms as park-goers gathered under their shade to enjoy classical music performances. Today, the Naumburg Bandshell hosts principally acoustical music events, like the Naumburg Orchestral Concert series.